While I have yet to watch “Aquaman” at the time of this review, it’s safe to say that “Shazam!” is the most endearing and feel-good of the new batch of DC films, known as the DC Extended Universe. Instead of brooding, cries of pain, and mothers named ‘Martha,’ all it took was a little heart, humor and family for “Shazam!” to solidify itself as a top tier superhero film. Not only is it a solid origin story, it also manages to remain serious despite being light in tone, and keeps things simple while building a fresh new DC world around its title character. When we meet Billy Batson (Angel), he’s been arrested and sent to child services after committing a petty crime. He’s been in and out of foster homes dozens of times ever since he was separated from his mom at a carnival. While most adults who encounter him view him as a wasted youth, those who see past his troubled past see a compassionate orphan who’s afraid of being abandoned and hurt again. One day he finds himself transported to the Rock of Eternity where a wizard, played by Djimon Hounsou, crowns him as a new champion of good, Shazam (Levi). The film doesn’t begin with his origin story though; it begins with the villain’s origin story. An adolescent Thadeus Sivana in 1975 (Ethan Pugiotto) is offered a chance at becoming Shazam, but instead shows the wizard that his heart can be easily corrupted. Statues of the Seven Deadly Sins, perched nearby at the Rock of Eternity, tempt him. When Thadeus is banished back to reality, he’s resentful that he wasn’t given the ultimate power. Now as an adult, Thadeus (Strong) doesn’t specifically seek the powers of Shazam, but the powers of those seven deadly sins who once whispered promises of vengeance in his young ears. The juxtaposition of Billy and Thadeus isn’t lost on the audience. Both deal with their own childhood traumas. Billy is lost in the worst possible way by his mother and Thadeus is emotionally and verbally ridiculed by his uncaring father. In two tales of abandonment, we see how two different circumstances can lead to two different outcomes. In that regard, “Shazam!” speaks more about the human condition than nearly any other contemporary DC film, save for “Wonder Woman.” Not everything is peachy about “Shazam!” though. It’s not that it’s too long, but it’s just that some of the middle of the film sags a bit as opposed to the beginning and end. There’s a lot of odd editing and set changes, along with some odd choices on how exactly Billy learns about the true meaning of being a superhero. There are also some stylistic choices that I could have done without, like the handful of horror scenes that don’t quite mesh with the family friendly tone of the film. These are just some nitpicky things, in an otherwise wholesome movie that’s sorely needed. 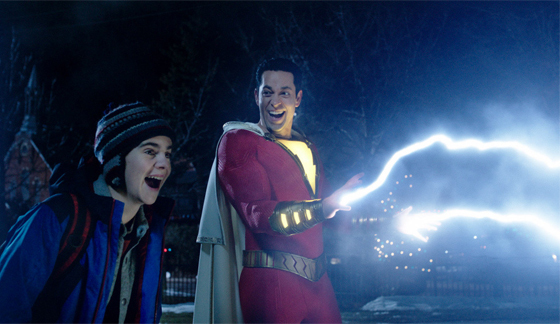 The character of Shazam is a blend of childhood innocence, teenage curiosity, and the more G-Rated elements of other superheroes like Deadpool or the Guardians of the Galaxy. Even with those influences, Levi and Angel propel Shazam to another level, not only creating a physical superhero force that could physically go toe-to-toe with Superman, but also a relatable man-child that’s equally harmless and adorkable. It’s hard not to love Shazam as he becomes acclimated with his power, but it’s when the audience watches him mature and open up his heart that we as an audience welcome him into ours. It’s safe to say that Warner Bros. and DC have officially washed their hands of the bleak, overly dark Zack Snyder comic book vision. Snyder’s name doesn’t even appear under the producing credits of this film. After a morose beginning to the DC Extended Universe, “Man of Steel,” “Batman V. Superman,” and half of the “Justice League” film, it appears that the secondary characters of this universe may end up salvaging it. It also might be a realization, especially after “Avengers: Infinity War,” that fans will only warm up to a dire and tragic storyline after years of sugary visual goodness and uplifting storylines.